CAMRA 'Good Beer Guide' listed. 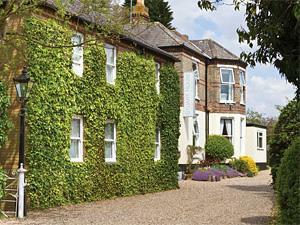 A homely independent hotel, quietly situated within its own grounds just a short walk from the historic centre of King's Lynn. All rooms are en-suite, with TV, WIFI internet and tea/coffee making facilities. The fully licensed restaurant offers a superb a la carte and table d'hote menu and the bar boasts a range of real ales and fine wine. Regular entertainment and theme weekends. Secure cycle storage. Children welcome from any age. From the A10/A47 roundabout. Head for the town centre. Pass under the 'Southgate' arch. First right and then 1st right again. London King's Cross to King's Lynn via Cambridge. Hourly service. Taxi's available at King's Lynn station.